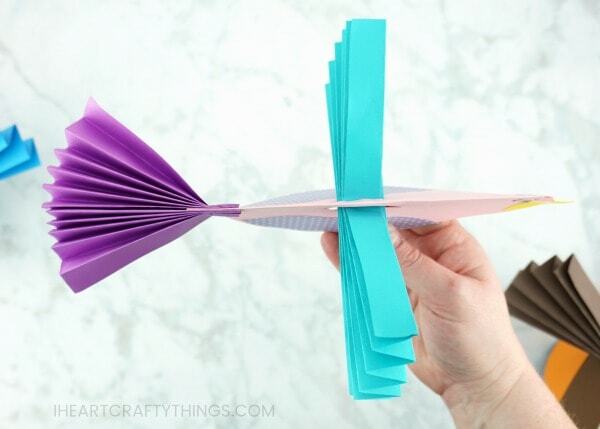 How to Make a Colorful Paper Bird Craft -Fun paper craft for kids of all ages! Spring time is the perfect season for sitting outside and enjoying some bird watching in your backyard or neighborhood. 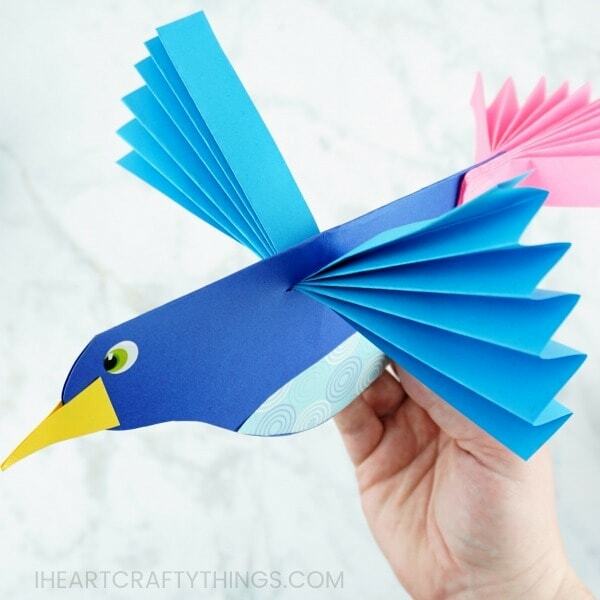 This colorful accordion fold paper bird craft is a perfect compliment to learning about birds this spring or summer with your kids. 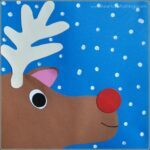 It is an easy paper craft for kids of all ages, and even for adults. Kids will enjoy flying their colorful bird crafts around all afternoon after creating them. Colored paper is a staple in almost everyone’s craft supplies. 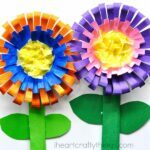 Whether you stock construction paper, standard paper or cardstock, there are so many simple and easy paper craft ideas for kids to enjoy all year long. 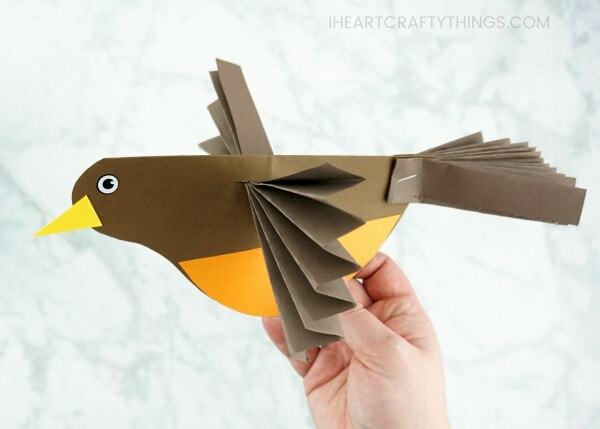 Making bird crafts is among our favorite crafts for kids. This colorful paper bird craft can be made in any variations of colors so it’s a paper craft kids will love customizing to make it their own. 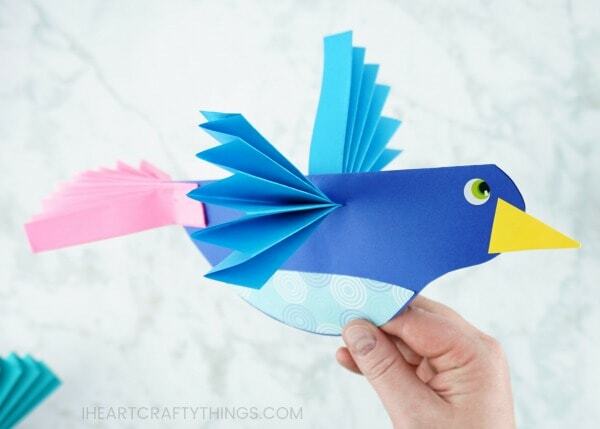 Children can fashion their paper bird to resemble their favorite type of bird like a robin or a blue bird. Or they may enjoy creating a rainbow inspired craft and end up with a completely unique bird design. Either way, children are sure to delight in creating this easy bird crafts activity. Bird Template <—-Get this in our shop! *We received our patterned scrapbook paper from our friends at OrientalTrading.com. All opinions expressed are 100% my own. NOTE: If you are in the EU, please visit our TpT Store to purchase any of our templates. 1. 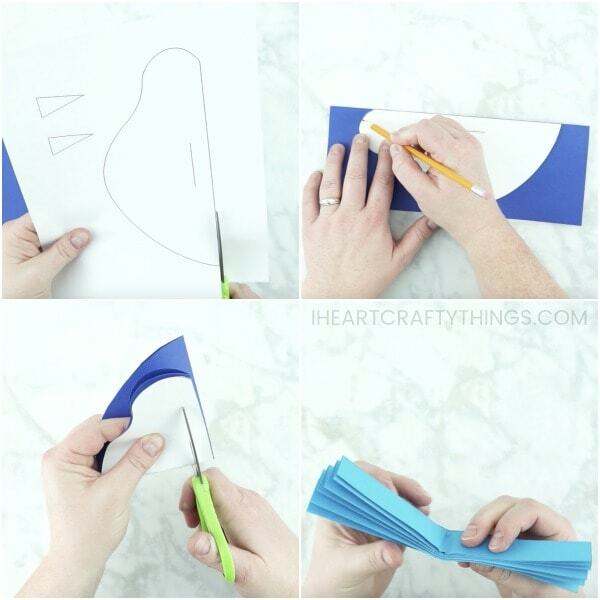 Begin by purchasing the bird craft template in our shop. Print out the bird template and cut it out. Note: If you prefer not to purchase our template draw your own bird like the one pictured below. 2. 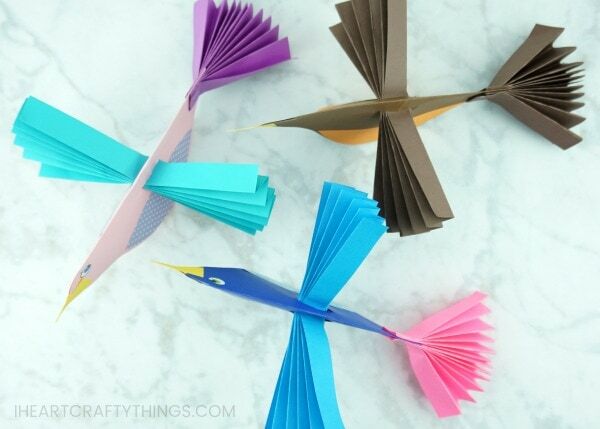 Choose a color of cardstock for your paper bird. Fold your cardstock paper in half, lengthwise. Trace the bird body template on the folded edge of the cardstock and cut it out. 3. Slightly fold the bird body in half and use scissors to cut the slit shown in the template. 4. Choose two pieces of color paper for your bird wings. 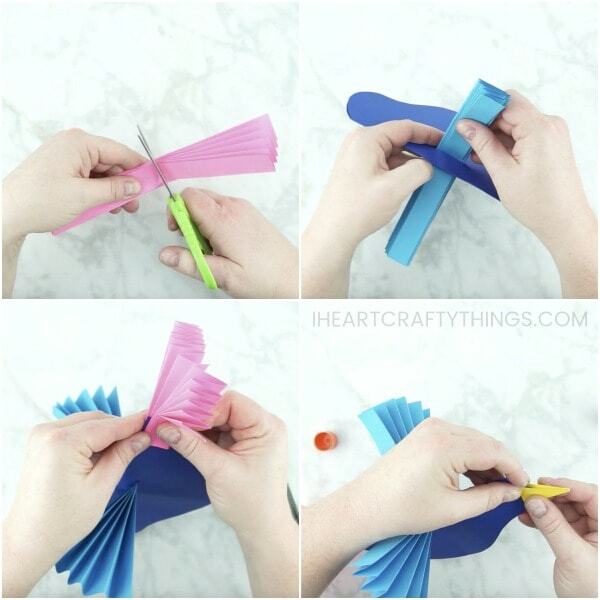 Fold both pieces of color paper in an accordion fold. Choose whichever color you want to be used for the main wings. Bend the accordion folded paper it in half and set it aside. 5. The other accordion folded color paper will be for your tail wings. Bend the accordion folded paper in half and cut it down the center of the fold to make two pieces. 6. Push the first accordion folded paper through the slit in the bird body with the bend upward. Spread the accordion folds out so the bird wings spread out. 7. Staple the two paper tail wing sections to the end of the bird body. 8. Cut out two triangles the same size for a beak and glue them together on each side of the bird face. 9. Go back to your bird template from step 1 and use it to cut out two paper belly sections and glue them on each side of the bird. You can use a solid color of cardstock or paper or add some texture to your paper bird by using patterned scrapbook paper. 10. Finish your paper bird craft by adding eye stickers on the face of the bird. You can also use googly eyes an alternative. That’s it! Your easy paper craft is complete. If you make this in a classroom setting, you can punch a hole in the top of the bird, add a string and suspend them down from the ceiling for a lovely spring crafts activity display. The colorful birds also look stunning set on display on a shelf or table. Watch the video below to be guided through each step of our colorful paper bird craft for kids. 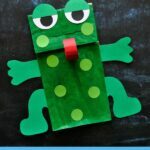 Looking for more easy paper crafts for kids not listed here? You can search our website by typing in what you’re looking for at the top of the page where the search bar is located. You can also browse through our category pages along the top menu bar of our website. If you are a fan of birds like me, you’ll love looking through our bird crafts category. Gearing up for spring craft season? 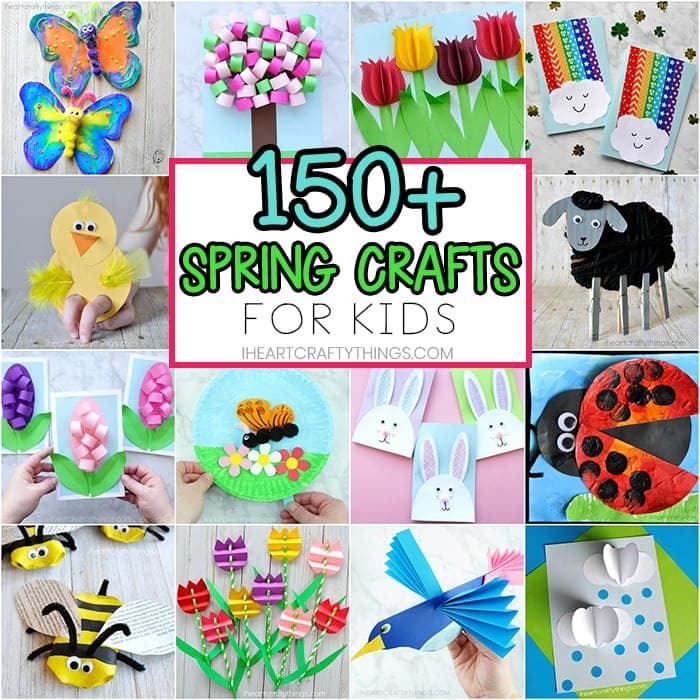 Check out this amazing list of over 150+ fun easy spring crafts for kids. This gorgeous birds on a wire art project is stunning and is perfect for a spring or summer crafts activity. Have you ever tried black glue art before? These darling insects are a perfect project for spring. This paper plate fluttering butterfly craft is fun to make and play with! Really loved the ideas. Anyway, which types of craft paper do you prefer?